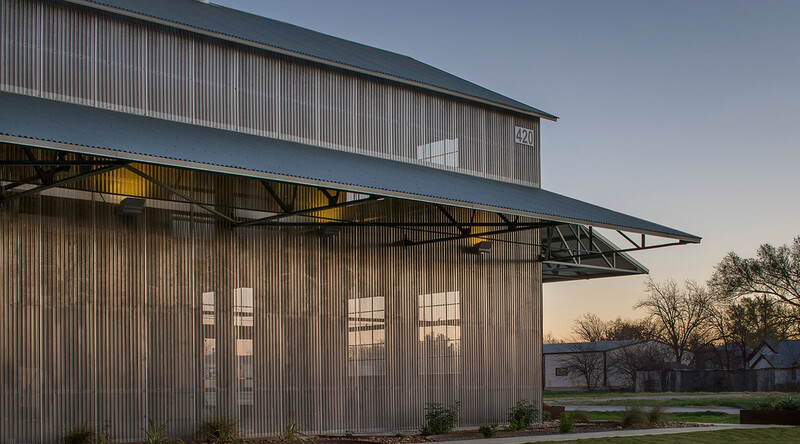 Reinventing the legendary Hutto Cotton and Grain Co-Op was a labor of love. 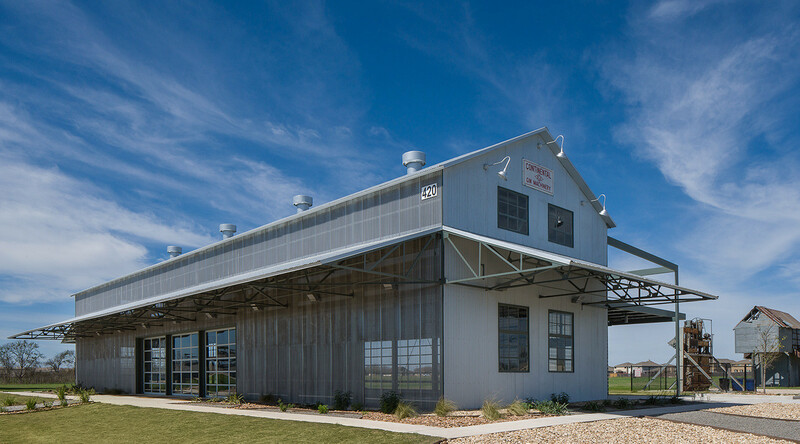 As the crown jewel of Farley Street in downtown Hutto, Texas, the $1 million redevelopment project required months of preparation and planning, over 33 tons of custom-fit steel, and a look back at more than a century of history. At that time, Hutto was one of the fastest growing cities in Texas, thanks in part to its convenient location adjacent to Highway 130 and nearby Austin. City officials conducted a study to review the lifespan of their various properties. 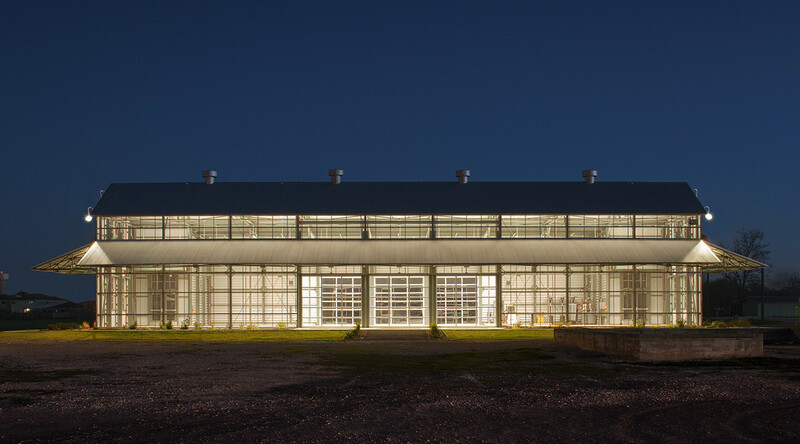 One option under consideration was to repurpose the Hutto Cotton and Grain Co-Op, which included two ginning facilities and seven silos on nearly 25 acres of property, as a new city hall. The economic recession of 2008 dramatically altered the scope of the project as funds were reallocated toward a new water treatment plant rather than a city hall, but officials soon set their sights on the gin again to act as a public space. The first step was to remove extraneous additions and cladding while reinforcing the roof trusses, wall studs, and other structural cornerstones. Antenora and the rest of the design team devised a concept they called the “glowing box.” Their goal was to drive traffic to the site with an airy, functional space and a dramatically lit exterior, relying on perforated EcoScreen metal panels by CENTRIA as the central design element and corrugated BR5-36 rainscreen panels to capture the facility’s previous aesthetic. The team from Antenora Architects, which included project manager Gordon Bingaman, was attracted to the “dual nature” of the stainless steel perforated EcoScreen panels, which serve as both a transparent and reflective surface. The building’s luminous aesthetic is created through a combination of natural and artificial lighting. The complex design creates the appearance of a solid, corrugated wall during daylight hours. In the evening, the light filters through the perforated panels to reveal the interior against a solid backdrop. The decision to specify CENTRIA single-skin metal panels was based as much on performance and value considerations as that of aesthetics. 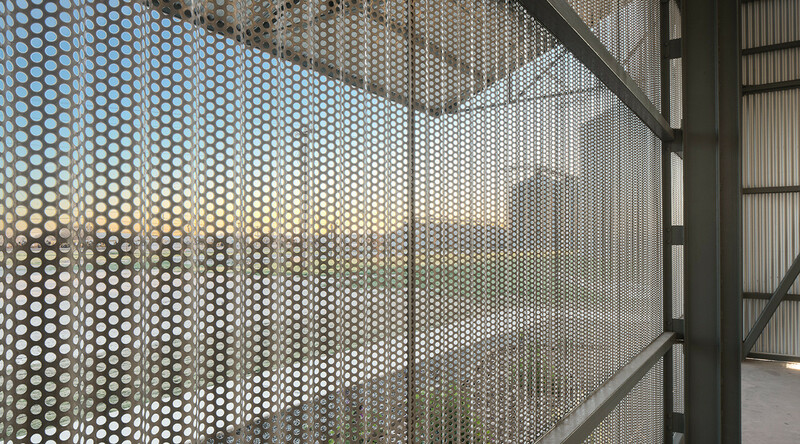 EcoScreen perforated screenwalls offer a 10–40 percent open area to control light and air movement while elegantly blending industrial and other applications with their surroundings. Designers relied on interior fans and four rooftop turbines to facilitate air movement throughout the facility. According to Bingaman, an expert in architectural historic preservation, the material’s durability and corrosion resistance was an important factor in maintaining functionality and preserving long-term investment. In addition, CENTRIA provided an outstanding level of customer service from project inception to completion. “It was the level of value offered by CENTRIA—the shop drawings, the quality of the accessory packs—that made the difference,” Antenora notes. Throughout the process, the city stressed the importance of sustainable building practices. Green by virtue of its composition of recycled materials and the absence of mechanical systems, the gin’s electric consumption is limited to highly efficient fans and lighting. The deconstructed cotton gins and silos were either reused immediately onsite, stored for reuse at a later time, or directly recycled, Bingaman says. The project achieved LEED Silver status. The renamed Gin at the Co-Op District has become the go-to event space in Hutto, with regularly scheduled co-op shopping nights, farmers markets and more. 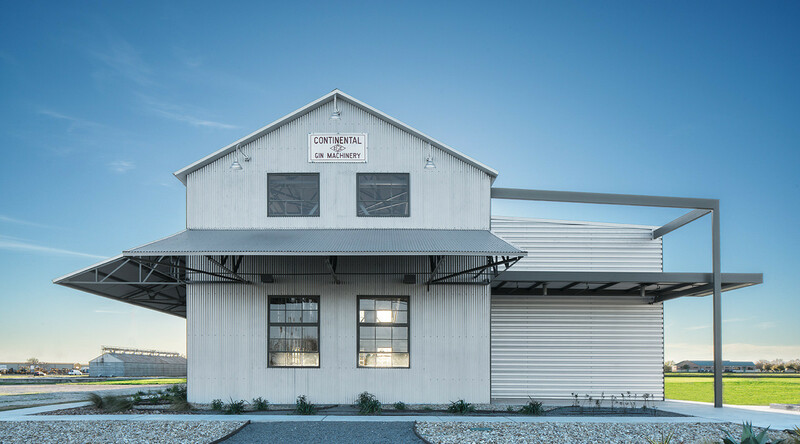 The preserved cotton gin stands in homage to the city’s decorated past and marks the first step of a comprehensive redevelopment that will serve the community for years to come.